PRISTINA, Yugoslavia (CNN) -- British troops shot and killed a man with a pistol in an exchange of gunfire in Kosovo's provincial capital Sunday. It was the first known fatality since a NATO-led international peacekeeping force (KFOR) began its advance into the Yugoslav province. The gunman fired at least one round at a British patrol in Pristina before the soldiers killed him, said Lt. Col. Nick Clifford, a spokesman for the KFOR peacekeeping mission. A NATO spokesman in Brussels told CNN the man was a reservist with the Serbian special police and was warned six times before British soldiers began returning fire. The shooting -- and the refusal of Russian troops to admit a British contingent into Pristina's airport -- underscored the tense nature of KFOR's march into Kosovo. 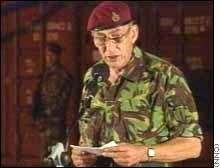 He said the soldiers involved acted "clearly and unequivocally" within the peacekeepers' rules of engagement, and he warned that NATO troops participating in KFOR would defend themselves as needed. "We expect all parties here to operate with restraint in order to bring peace and stability to Kosovo," Clifford said. Clifford refused to offer further details of the shooting. The violence occurred as peacekeepers in Pristina searched for an alternate base to replace one at the city's airport, where Russian troops turned away a British-led detachment in a move NATO's top general called "bizarre." 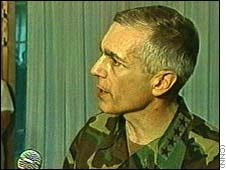 Gen. Wesley Clark, NATO's supreme commander, said the NATO-led KFOR peacekeeping mission was proceeding into the Yugoslav province on schedule. Clark said NATO could have as many as 10,000 KFOR troops in Kosovo by Sunday evening. British, U.S., French, German and Italian troops rolled into the province Saturday to begin Operation Joint Guardian. But a column of Russian troops unexpectedly beat the NATO peacekeepers into Pristina and blocked access to most of the city's airport by parking an armored troop carrier across a road. NATO and Russian officials were holding talks in Moscow, Skopje and Kosovo in an effort to resolve the impasse at the airport and to determine the role of Russian troops within KFOR. Clark downplayed the military significance of the situation, since the airport was never going to the main headquarters for KFOR. He emphasized that diplomats -- not soldiers -- would find a solution. KFOR will have little difficulty finding another place to set up a temporary headquarters for its advance into Kosovo, said Brig. Robert Baxter, a British officer at the airport. "We have standbys, and we are now going around looking at all the alternative sites," Baxter said. Baxter described his talks with Russian officers as "friendly," though they firmly refused to allow his troops into the airport. Outside Pristina, the roads were full of military vehicles -- either Yugoslav troops on the way out or KFOR units on the way in. Photos from unmanned reconnaissance planes showed Yugoslav tanks, artillery, armored personnel carriers and one helicopter leaving Kosovo. As KFOR units, led by British and French troops, made their way into Pristina, they were greeted by crowds gathered along the road chanting "NATO, NATO." One man said, "We're all happy, the old, the young, simply everyone is happy NATO is here." KFOR will divide the province into five zones, each controlled by troops from a different NATO country. 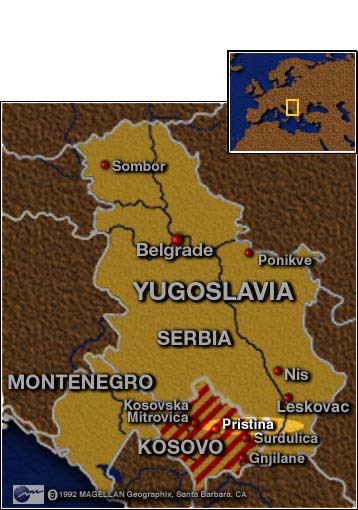 While the French hold the north, the British zone covers the east-central part of Kosovo, including Pristina; the United States will take southeastern Kosovo; the Germans, the southernmost portion of the province; and the Italians, the west. The first major U.S. force moved into Kosovo on Sunday: paratroopers from the 82nd Airborne Division, a Marine expeditionary force from the USS Kearsarge, backed by tanks and armored vehicles. 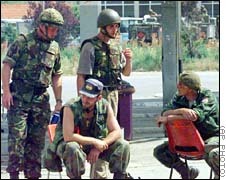 The U.S. troops were expected to relieve the French in southern Kosovo as they moved on to the northernmost sector of the province. The arrival of NATO troops did not signal an end to the bloodshed that has characterized the fighting in Kosovo. Members of the Kosovo Liberation Army discovered 14 bodies in the central Kosovo town of Malisevo. Among the dead was a decapitated woman, a freelance journalist reported. The ethnic Albanian KLA group also encountered dead animals: dogs, cats and horses. Some Serb forces that pulled out on Friday apparently rolled over abandoned cars with their tanks and set fire to tractors and homes, the journalist said. French troops in eastern Kosovo saw homes burning and reported sporadic bursts of machine gun fire. Some French convoys were halted for hours as roads were swept for mines. 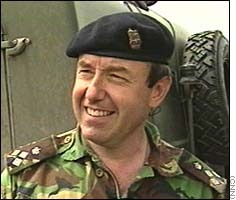 KFOR's commander, British Lt. Gen. Michael Jackson, warned the withdrawing Yugoslavs to refrain from further atrocities. "Noncompliance will not be tolerated from whichever quarter it may come," Jackson said Saturday, speaking at the Pristina airport. Correspondents Tom Mintier,Christiane Amanpour, Chris Burns and Steve Harrigan contributed to this report.